help me figure out my holy grail, wise ones? i come in search of gel. so i know that the "official" geltips were the rooneys and m&fs from a certain time period. i have an m&f 2xl from this period, and the lathering is soft like no other on my sensitive skin, even after 3 passes. but, the handle is a bit small for me. can anyone point me to models that might be my holy grail? You're likely to find gel tips in 2 band or finest brushes but also in 3 bands and/or "silvertip" that has been sterilized and chemically treated for visual or softening effect. I don't think you will have to get anything too hard to find. How much can you afford to spend? You could look for a 3xl. TGN also has two band finest knots occasionally displaying the hooked tips. If you find a knot from TGN have an artisan make a handle that is right for you. You might have better luck going for a 3xl as you know what your looking for and TGN might be luck of the draw. For budget try Maseto finest (eBay). For a lot more money try Saponificio Varesino. Both the brushes I have from these two companies have developed gel-tips. Agreed, the 3XL is a much better handle size. I have/had a few brushes from Brad Sears with the knots that he procures separately from his collaboration with Lee Sabini. Brad's knots have all had nice moderate to strong backbone and gel-like tips. 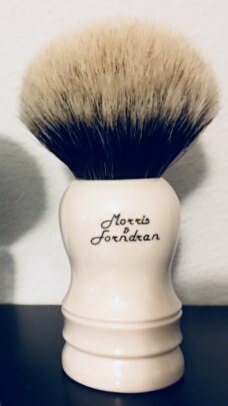 I’d recommend finding an older Lee M&F with Emillion handle. I find the handle to be very substantial, beautiful, and - unlike most larger handles - very ergonomic. Try the Maseto for a budget gel tip.